We have stayed at a villa by the side of the fifth fairway and played the Alto Golf & Country Club several times. We liked the views and the fact that there was much more than golf, with the full country-club facilities and the lovely town of Alvor nearby. The golf course was quite busy in October, but the weather was marvelous! Alto is an ideal place for a holiday, not too strenuous but very interesting and quite challenging. We recommend a buggy, but it is not too long a course to walk. We stayed with Independent Villas, who were knowledgable and helpful in every way. They set us up a tailored golf package with unlimited golf, car hire and flights so we did not have to worry about anything, just enjoying ourselves! 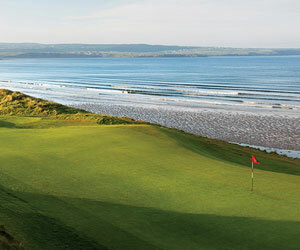 "My wife and I have played lots of courses throughout Ireland and have played this beautiful course about 4 or 5 times now, and we both agree that it is one of the best golf courses in Ireland," GolfEurope.com reader Don Kirkaldy reports.